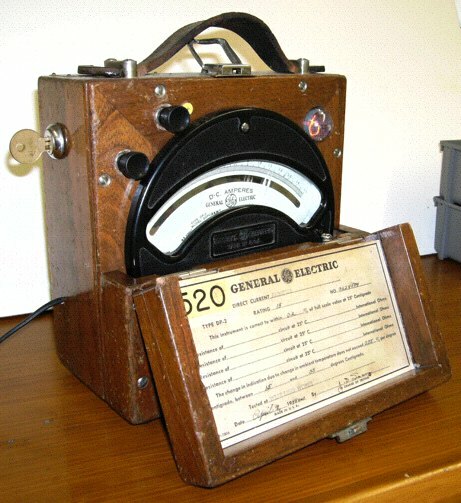 This clock is based on a General Electric ammeter with a 0-15 scale, dated 1948. The case measures about 8" by 8" by 4.5" (not counting projections such as the handle) when closed. I added a single Nixie in the top right corner, replaced the original binding posts with similar-looking pushbuttons for controls, and installed a key switch on the left side to enter setting mode. The software for this clock is basically the same as my type 1b design, modified to produce an analog output (via Pulse Width Modulation) to drive the meter, and have settings to specify what element of the time or date is shown on the meter. (One of the options is the day of the week, something none of my previous clocks have been able to display.) Somewhat more control over what the Nixie displays has been added: on this clock, it's reasonable to display only the hours, or only the minutes, if the other component of the time is being shown on the meter. Click here for the clock's instruction sheet (in Adobe PDF format).